Every school child is taught that Henry Ford, founder of the Ford Motor Company, invented the assembly line back in 1913, but you shouldn't believe everything you hear. It was actually Ransom E. Olds, of Oldsmobile fame, who invented and used the assembly line in 1901 to produce his cars. What Ford actually invented was the conveyor belt assembly line, which sped up production of his Model T and was the gateway for MASS production. Until the assembly line came along, products were made by hand and usually by one person. But the concept of standardized parts that fit together had been around for a long time in Ford's and Olds' day, and using an assembly line became a no brainer. 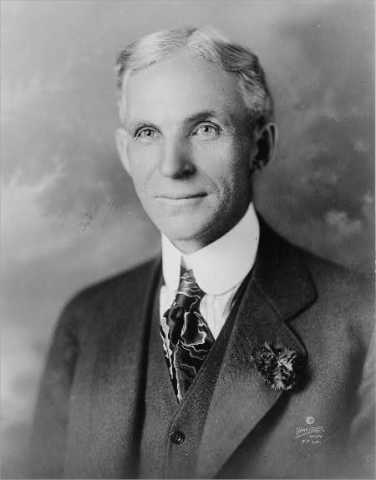 Ford was 40 years old when he founded the Ford Motor company in 1903, and the Model T is considered the first mass-produced car, which fulfilled Ford's own prophecy "I will build a car for the great multitude." Of course, assembly lines are even faster and more automated now. While some companies still combine human labor with machine, in many cases an entire factory is filled with machinery that assembles the product with no human involvement. See the Assembly Line Wikipedia Article. Ford's Wiki Page and Books about and by him. His biography is free on Kindle. See Ransom E. Olds Wiki Page and his biography.